The pictures below have all been made in March 2001 during a visit from my brother, Piet Van Bockstaele. 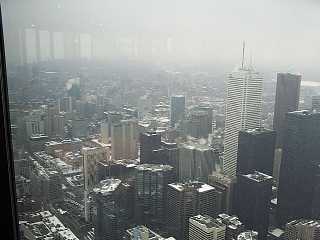 All these pictures have been taken through the windows of Horizons Caf� and the lowest observation decks. Hence, reflections can sometimes be seen. That's a pity but also unavoidable. 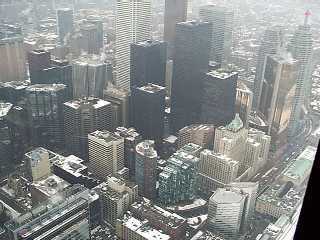 The upper left corner is Toronto's harbour. It can be seen that the harbour extends to a long archipelago of small islands. These are a very popular attraction, especially during the summer months. 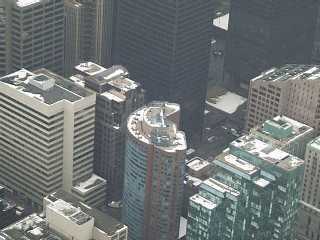 The small group of tall buildings consists of a hotel and appartment buildings. The Westin Harbour Castle Hotel formerly belonged to the Hilton hotel chain and as such was featured in the popular series The New Avengers. 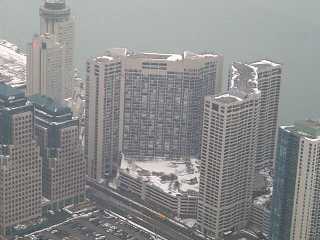 The upper left corner is the Westin Harbour Castle Hotel. The round structure topping it, is a revolving restaurant. 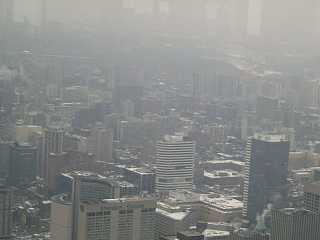 The two buildings next to it that together make up a funnel type shape are interconnected condominium buildings. Between them, you can see the roof garden on the seventh floor. These buildings are connected to the Westin Harbour Castle Hotel via a a covered bridge. At the right one can see the Union Station marshalling yard. More or less in the lower middle, it is possible to see the green roof of one of the most prestigious hotels of Toronto: the Royal York Hotel. 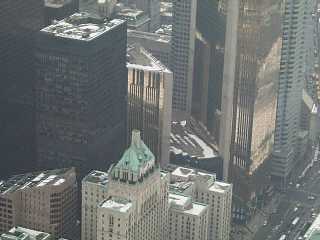 The other buildings are skyscrapers in the financial core of the city. Here, the Royal York Hotel can be seen more clearly.